Hope you all are having a great and relaxing holiday! Today as always I'm going to bring you my latest gold making escapades in the past week, in hope of helping you, and/or letting me vent a bit (you'll see below). Tailoring has been really good for me the past few weeks. I am still burning my daily CD, and selling both the crafted PvP sets and the Imperial Silk crafted (ilvl 476) gear. Both at an amazing profit. I actually can't keep the Imperial Silk crafted gear on the AH long enough to replenish it with my daily cooldown, which is nice! I'm tending to craft only the gloves now, as both gloves and robes sell for about the same on my server, and gloves take 2 less cooldowns. If I work up 6 cloths before I sell a pair of gloves though, I will make the robes. As for the PvP gear, for some simple calculations I figure each PvP piece takes about one stack of Windwool (ie. 4 bolts) on average. This means that for anywhere from 20-40g I can craft one piece of PvP gear. That means Selling it from 150-350g is well worth my time! I'm also crafting Netherweave Bags while AFK because the profit margins are strangely high on my server right now. As I mentioned a few weeks ago when 5.1 dropped, I started planting Enigma Seeds. I'm now using them to make flasks with the rest of the herbs that come up, since my 90 is an alchemist. Just adds a little bit of value to my Lotus, but well worth it, as they both sell just as quickly for me. Also, I've been using a spreadsheet to calculate my minimum Living Steel method (since TUJ doesn't account for procs from transmuting). It's going well, but my profit margin is only about 100g on any given day, with procs taken into consideration. With 4 alchemists, this means 400g/day so I can't complain for what little work I do to get it. So recently I saw a Battered Hilt on the Black Market Auction House. The starting bid was 15k and I know I can probably get anywhere from 25-30k on my server for such an item, and I figured if it didn't sell, I could use it myself, I've always wanted to do that quest line. I won the bid at 15k and got the item, only to see that I had purchased the Alliance only version on my Horde character. So I almost instantly opened up a ticket with a GM. I got my response within 48 hrs, and I was not very pleased with it. They said 2 things: 1) They would not change the item to the Horde version and 2) They would not refund me the gold I payed for the item. Bummer. So I'm out 15k, it's my own fault but I figured they'd at least swap it for the Horde version, but what can you do. Lesson learned, watch out for faction specific items on the BMAH. That's about all for this week, it's been a lot of sales I figure because the college and high school kids have off this week through New Year's, and I've gotten a noticeable increase in sales, which is always welcome. I will try to do another post some time before 2013, but I'm not sure that I will have the time. In any case, I hope you all have a Happy New Year! If you read my post yesterday and liked it, a reader, lasagna left a note in the comments, and pointed out that there's an even FASTER way to do this search, which takes little (or almost no) time. It involves using a dealfinding search with up to date scan data so that it only scans items that are actually on the AH, below a defined price, and takes just seconds to do! Since you need recent scan data, there are two ways to go about it. The fist is using the Tradeskillmaster App, which will download your data about once per hour (it's an external application to WoW), and you can get that data into WoW with a /reload. What the dealfinding list is going to do, using this strategy, that a normal shopping list won't, is it will only check for things that were cheaper than your threshold at the last full scan. Using this TSM App, downloadable straight from the TSM website at this link, you will be able to constantly update your data without ever doing a scan in game! You will have to do a /reload to retrieve the most recent data if it has scanned since you've been logged in, it's a very useful application to have. While visiting TSM's website, be sure to check out their Child's Play Charity Fundraiser. They're currently raising money for the Child's Play charity, and are matching every donation made! Alternatively, if you don't want to download the application, you can just click Run Scan (under AuctionDB with the AH window open), and then "Run GetAll Scan". This will also provide you with the data you need to do a quick dealfinding search. If you want to skip my ramblings and just download the precious lists, click the "TSM Transmog Lists" button above. Now there are two different ways to do this, and I'm just going to go into what each scan brings to the table, and why I personally prefer one to the other (although both are extremely useful in their own way). The way we're going to use these lists, they're going to take our recent scan data, and then use our list to only search for items that were below our threshold price at the last scan. Basically it will scan only the items that are on the AH, below your defined price, which is very nice. The list I prefer is one where the limits are set just below my 750 minimum posting price, at 745. This scan is preferable to me because I will not be scanning any of my 800+ auctions, saving a lot of scan time for me. The con of this list is that some items you'd be willing to pay more for, you won't see. The best deals for flipping on the other hand will mostly be below 745 gold, so to me, it's preferable. Now if you either don't have a large inventory, or just want to see EVERYTHING, that is another viable option, my second list has a limit of 999,999g99s99c, which will of course show you every item. This list will scan every item that was seen in your AH at the last scan. This will still scan less items than a shopping list, but will find your own items. If you want to easily change your limits to whatever you see fit (especially if you have different limits than I do), see my quick write up above the lists. All of the lists can be found at this link, or by clicking the "TSM Transmog List" button above. Last but not least I will go over how to import a dealfinding list for those of you who do not know how to. First type /tsm, and click Shopping Options at the top. After doing this, click Dealfinding Lists then Import Dealfinding list. And there you go, your list is imported!! Now to use the list properly for fast search times, do a GetAll scan or refresh your data if need be (detailed above). Then, in the TSM Auction House window, click Search -> Special Searches -> Dealfinding Search. And there you have it! A Simplified Search! Thanks once again to lasagna for this awesome idea, for some reason it never occured to me, but doing it is so simple and worth it! This is intended as a simple guide to purchase transmog gear in the most efficient way possible. If you're not familiar with Transmog or TSM, learn how to use the addon package TradeSkillMaster before reading this guide, it's necessary, trust me. Check out Faid's Instructional TradeSkillMaster videos here. Tradeskillmaster: I use this to buy, post, and empty my mail (as well as keep track of sales). In particular you'll only need the Auctioning, Mailing, and Shopping packages, but all are recommended. Mogit: Great addon that adds hover over previews to armor items. You'll have to check off "Load out of date addons" on your login screen for this one to work in it's current version. It works flawlessly though, which is probably (hopefully) why they haven't updated it for 5.1. A lot of gold makers use separate lists, say Cloth, Leather, Mail, Plate, Weapons, and Shields. While doing this has it's pros, you're wasting a whole bunch of your own time sitting and searching for 100 items. I often found myself AFKing or browsing the web while doing these searches, and coming back to searches that were completed 10 minutes earlier because I got distracted. Then it hit me. If I'm going to do 6 huge xmog searches, why not do them all at once? Search for 500-600 items, browse the internet, go AFK, or read my Favorite Gold Blog, and then come back later and go through the results. I've tried it out for over a week now, and I really like my results with this method. Generally I'll buy anything under 50g on this list, and the rest I judge by the appearance whether it's worth buying to flip. My list is based on a compilation of these lists from Faid at GoClockorkRiot, Shannon, and myself. Shannon's list I trimmed down a bit for my own tastes, it originally had over 200 weapons, it now has only 151. As you start working with transmog gear you may decide you want different prices or more tiers based on your server's needs. This is what works for me, and I've had success with it. The first 2 groups above were originally 500 and 1k in Cata, and I bumped them up when MoP was launched because inflation. Use your best guess. Transmog doesn't sell constantly, so don't change your price levels around too much at first. You have to set a standard for your server, and possibly work against any competition. Use your best guess when first making sets. Base it off of the look, and what you think you can get out of your potential buyer for it (use Mogit to mouse over and see what it looks like). Below is the list, Import it by typing /tsm, going to the Shopping Options tab, clicking Shopping Lists, then Import Shopping list. Name it and copy/paste the following data into the "List Data" field. Hit the Accept Button, then Import List. I had some trouble importing this list, most likely because it's so huge. The name didn't go through at first and it took a while to load after importing, but these are minor problems that should not effect the list. Tomorrow I'll be going over more specific strategies I use. This should be more than enough to get you going for the time being! Those of you that have been regular readers of my blog for a while know that I used to regularly come out with a "weekly review" going over what worked for me and didn't work for me in the past week in WoW. I haven't come out with one in a while since MoP launch, but I think that now is a good time in the expansion to look at weekly trends. Living Steel has still been strong for me. I get weird peaks and valleys of selling it, it seems that when it does sell, it sells somewhere in the 8-12 range at a time, which is nice. Again being on a small server, I'm sure most other servers have a steady in and out stream of Living Steel, but it's just not the case for me. 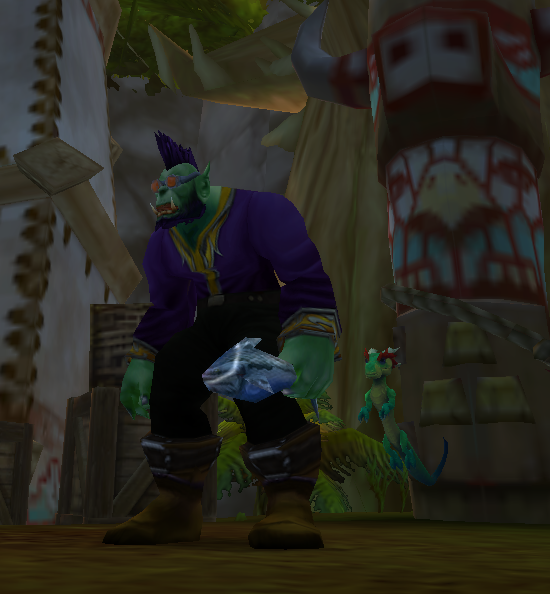 My level 1 transmog seller (pictured here) has been very busy as of late! This week I tried a new strategy with transmog, which I'm liking quite a bit and I'm going to address in it's very own post. What I've been doing is searching for items 600 at a time. Yes. A 600 item TSM list that takes a ridiculously long amount of time to search for. I go afk or browse the internet while it's working, and go through the results when it's done buying anything under 50g that will sell. It's been working quite well so far, and hopefully later today I'll have a post up here including my list and how to use it if you're new to transmog (or not). It makes transmog shopping a bit more painless, which is always great in my opinion. On my server DMF trinks are still going strong, during DMF I was able to sell quite a few individual cards for a nice markup, and I came out with 3 trinkets (one of which sold already). A good haul IMO, still burning those cooldowns daily, and will in the weeks to come! JC has also been doing decently well on my server, mostly because the halving of the ore nodes actually impacted my server. A lot of servers are back to normal, or at least near it, but my server, because of it's smaller size still has high prices on Ghost Iron Ore, and it's making gems worth slightly more, which is nice. Worth me doing a bit of prospecting and cutting now with my WoW time. If you haven't been already, get rep with the Tillers! I've been planting Enigma Seeds recently (see my previous post) and I'm making about 750g/day worth of herbs. Quite the nice haul from farming. In Halfhill as well there is Nam Ironpaw, and this dude should be your new best friend. If you go to theunderminejournal, and click "Gathered -> Cooking" after getting on your server, you'll find a list entitled "Ironpaw Token Trades" of the cheapest items turn into Bundles of Groceries (containers from Merchant Chang after doing starting quests). Buy those up off the AH, bundle them up, and exchange them in Halfhill for Ironpaw Tokens. Using them you can buy 100 Year Soy Sauce, Black Pepper, and/or Rice Flour and sell them for a markup on your AH. I find that these usually sell to people who are trying to max their cooking for the first time rather than max chefs for raiding guilds. The max chefs tend to know about this arbitrage, but are using it for their guilds. That's all for me, one last thing to note is I recently bought a Battered Hilt off the BMAH for 10k, and I put myself on a deadline to sell it by the end of the year. If I don't I'm going to do the quest line myself as I never got to do it in Wrath. My week in WoW was pretty good, I crossed the 1.75 million threshold on my server, aiming for 2 million by Jan 8th, but we'll see how that goes! Also bought an invite to the Brawler's Guild, and I found it quite boring actually, but I did not pay much for it, so no big loss there. How was your past week in WoW gold? What is/isn't selling for you? Many times, as gold makers, we get dismayed if we can't make some major returns on our investments. I know I always try to focus on the highest return activities, well letting others fall by the wayside. Flipping things for twice what they cost is almost ingrained in our brains. While this of course is the easiest and fastest way of getting gold, there's no point missing out on other opportunities available. Diversify! Quite like real life, the more you invest in profitable things, the more money you're going to have in the long run. Say (hypothetically) you are able to make a 10% return per day by using some profession, selling everything you post daily and using the new amount as investment capitol. By the end of the week, you would have (roughly) doubled the money you initially invested. Now there are of course better investments than this to be made in WoW, but know that every investment counts, small investments that sell constantly are just as good as long term investments that make tons of gold from 1 sale (such as transmog/leveling green market). That being said you can't do everything all the time. Some days you don't play, some days you don't have time to play the AH, or only a limited time. Do what makes the most gold for you. This is hopefully something everyone already does out of instinct alone. Daily cooldowns to me alone across a few characters are more than enough for the average player to have a mass of gold, and be able to pay for what they want (within reason) in game. But just because uncut gems are 50g and the cut are 70g, doesn't mean that this 20g isn't worth your time. When I post a spread gems on my server, I sell at least a handful each day. At 20g profit per, even with selling costs factored in, it's not a negligible gain in gold each day. That doesn't mean I'm going to focus in on JC first, by all means I'm not. I prefer to focus in on things like Inscription CDs as well as Alchemy and Tailoring before I get into any sort of mass processing of ore. Diversification is key though, and it's important to do the things that may not net you as much overall gold, but good and fast returns.